Screen magnifiers are a very useful software option for increasing the accessibility of computers to the low vision computer user. They are widely available for all operating systems, and range in complexity from basic magnification to multi-featured software packages that incorporate magnification, text scanning (with Optical Character Recognition), synthesized speech, and support for braille displays. They range in price from freeware to over $2,000. The needs of a low vision computer users vary greatly from individual to individual, so the software programmers have made a wide variety of features to better serve the community. What follows is a description of several types of features found in magnification software. 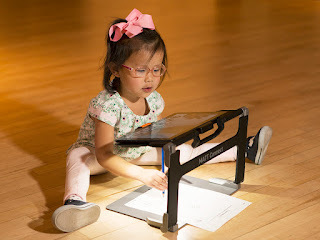 There is a wide range in the amount of magnification available, from simple 2x programs to programs that offer 2x, 4x, and 8x to programs that offer 2x to 32x and anything in between. There are four basic display types available in these programs. The most basic type is to magnify the entire display, which means that the image no longer fits on the screen and the user must scroll through the display to see everything. The next type of display involves using the mouse cursor as a sort of magnifying glass ; this type has two options. In the first option, the mouse cursor becomes a virtual magnifying lens and magnifies what is found under the cursor. In the second option, the area around the mouse cursor is magnified and displayed in a stationary window elsewhere on the screen. Many programs offer the user both of these options. The third type of display is similar to the last one, except that the area around the mouse cursor is displayed in a resizable window, allowing the user to adjust the display area to suit his or her needs. The last type of display is the split screen, where a portion of the screen is divided off of the main display and devoted to displaying the area around the cursor. This can be either a vertical split or a horizontal split, as defined by the user. The more complicated programs usually offer the user the choice of any of these display types, while the basic programs usually use one of the first two types. Because extreme magnification settings distort the characters displayed, most packages include "font smoothing" to compensate for the distortion. The quality of this effect varies from package to package. Another tool available with some magnification software changes the screen display colors so that the user can adjust the display to her or his liking. The producers of these software packages offer free trial or "demo" versions to give consumers a chance to try the software out (for a limited time) before paying for it. This allows you to experiment with the different packages for free until you find the one that suits you the best. These "demos" are available either by download from the Internet or on disk by mail from the manufacturer. The prospective user should visit The Screen Magnifiers Homepage,, a great website with product reviews, a fairly comprehensive product list, and links to manufacturers' websites. Virtual Magnifying Glass is a free, open source, cross-platform screen magnification tool. It is simple, customizable, and easy-to-use. Runs on Microsoft Windows Vista, XP, 2000, NT, ME, 98 or 95. Also runs on a UNIX system running X11 (any Linux Distribution, FreeBSD, etc) and Mac OS X 10.4 or superior. Click this link to learn more about the FREE Virtual Magnifying Glass at http://magnifier.sourceforge.net.